DML had a 30 year old free breathing mineral oil distribution transformer located indoors within the dockyard. It had become extremely wet, with core insulation readings by Megger test of <20MΩ. 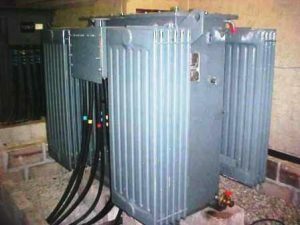 Oil testing showed that the transformer had very wet insulation; the mineral oil water content was 51ppm with a breakdown voltage of only 22kV. Both of these values were well below acceptable limits and so the transformer was taken out of service and earmarked for removal. Following consultations with the MIDEL team from, DML chose to retrofill the transformer with MIDEL 7131. This decision was taken to save substantial cost, compared to replacing or refurbishing the transformer. It was believed that the use of MIDEL 7131 would dry out the insulation and enable the transformer to be re-energised without the need to relocate it. To monitor the condition of the transformer closely during the retrofill, a field trial was conducted between MIDEL and DML. The mineral oil in the transformer was tested prior to retrofill to check the furan content as an indicator of the cellulose condition. The value obtained suggested that the cellulose was in a suitable condition for the retrofill to go ahead. Members of the MIDEL team attended site for the retrofill and arranged for the testing of oil samples every day for the first seven days at a laboratory. After seven days, the moisture content of the MIDEL oil had risen to around 350ppm, but the breakdown voltage was maintained at a high level. After 25 days the resistance of the transformer had risen to a value of >80MΩ, a great improvement on the initial result and a demonstration that the moisture content had been reduced in the cellulose. The overall cost saving by retrofilling, rather than replacing the transformer, was substantial.